Who says neutral has to be boring? 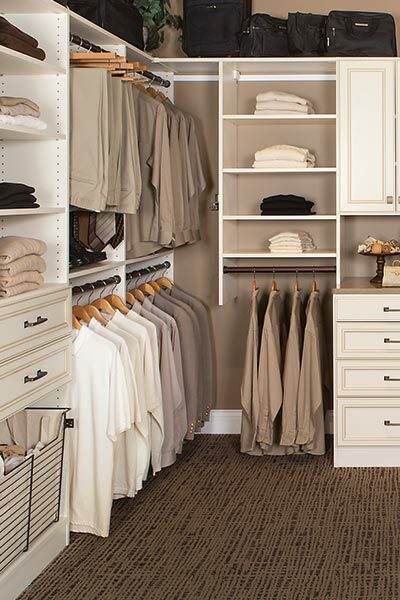 This closet design offers a simple and elegant solution to organizing a dark, windowless walk-in closet. The ivory color scheme brightens the room, but is warmer and richer than bright white. The center of the floor was purposely left open to keep the space from feeling crowded, while the storage otomons provide seating and a place to keep purses or other accessories. 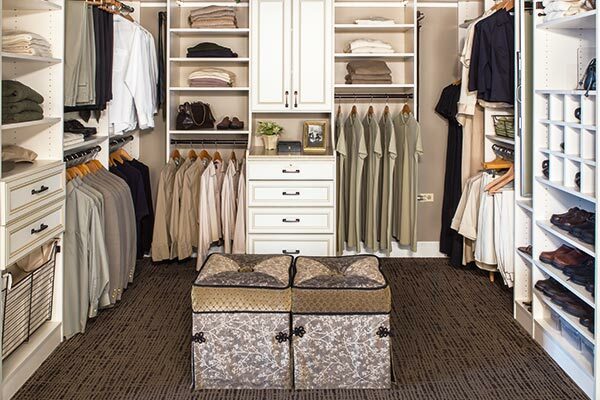 This closet design provides maximimum open floor space without sacrificing storage capacity. 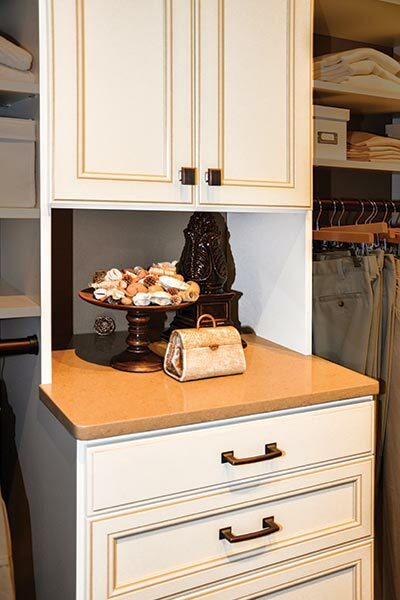 The center of the floor remains open by designing a closet hutch instead of an island to handle needed countertop space. Keeping the floor area open allows for the option of adding seating to the space — a great feature when you want a place to sit down and put on your shoes. Using otomans that open up as seating rather than chairs increases the storage even further. 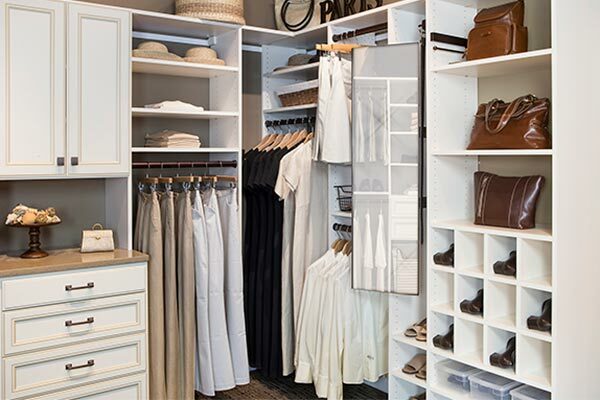 Additional features in this closet include shoe cubbies — a convenient way to organize footware that keeps the closet looking pretty — all Closet Works shoe cubbies are built from sturdy, long lasting 5/8" material rather than the 1/2" or 1/4" laminated particle board used by our competitors. 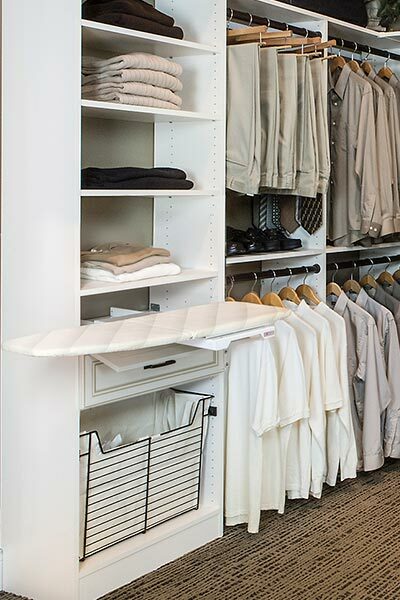 Folded clothing and accessories are organized easily on the shelves. The many fold-away and built-in organization components add additional functionality on an as needed basis, such as the drawer ironing board and the pull-out mirror. The wire hamper with canvas liner offers a neat and easy to clean solution for containing laundry. This closet design purposely stops short of the ceiling — the long shelf across the top allows for storage of bulky items like suitcases.